TRIPAWDS: Home to 13655 Members and 1543 Blogs. 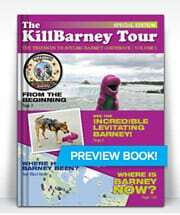 Get the KillBarney Tour Book for photos and stories of Tripawds members around the globe! Costs of Amputation and Chemotherapy for Dogs: What Did You Pay? Good question. Not sure … aside from the dosage (based on each dog's weight) varying costs may be determined by each facility's capabilities. We presume cancer centers that administer chemo regularly will offer better pricing for the drugs (which they probably stock in-house) than those which must special order chemotherapy mixes for each treatment. Total cost of treatments? – First treatment was $625, but that inlcuded chest x-rays/ultrasound, and meds. Future sessions should be between $200-$300 each. We did not hesitate to make the choice for amputation, but laying awake the night before the surgery worried about how he'd do, there was a very,very, very small voice inside of me that wondered if spending almost $3000 on a dog over 13.5 yrs old was a fiscally responsible decision. But, someone very wise said the following to me – After the 13 great years that Zack provided, he deserves it. And, that put it all in perspective – he is worth every penny we spent/will spend and more! And, seeing him come through the surgery and thrive is, as someone in a prior post said, priceless! Zack lived a full 14 years, even to the end. The joy and memories he provided us will last a lifetime. Surviving him is his sister, Izzy, a 12-year-old boxer mix quadpawd. And the latest addition, Zula, an 11-month-old pit bull mix tripawd. Regarding chemotherapy costs it just depends on how much the drug is marked up as well as cost of supplies like IV catheters, etc. It also depends if blood work is sent out or done in-house (CBC). In general you would expect to pay a little more at the oncologist since you are paying for a specialist's time and experience. My Tazzie was 185 pounds and I took her to the oncologist for her first carboplatin treatment since I had not used that drug before. Even with a professional discount that first treatment cost $720 (she warned me it would be pricey!!). When I did subsequent treatments myself they cost about $100 for drugs plus supplies. It is well worth the extra cost to see a specialist if your private vet has not had experience giving chemo injections since you must know each drug and the possible side effects. Some private practitioners do a lot with chemo so feel okay giving it so it never hurts to ask! Regarding chemotherapy costs it just depends on how much the drug is marked up as well as cost of supplies like IV catheters, etc. It also depends if blood work is sent out or done in-house (CBC). In general you would expect to pay a little more at the oncologist since you are paying for a specialist's time and experience. That is excellent feedback Doc, thanks for the enlightenment, that totally makes sense. Honey's nickname “Honey Monster” changed to “Money Monster” – worth very penny. Dx Osteosarcoma 3/31/10. Amputation 7/21/10. Honey put up a valiant fight and lost her battle 9/22/10. Missing her and treasuring 9 years with our Honeygurl. Thanks for the info! Keep ’em coming pawrents! Private practice or teaching hospital? Private practice. Total cost of surgery? $3,500? In your heart, where I belong. Type of chemo given? Don't know yet if chemo will be needed. Private practice or teaching hospital? Note: Dakota got into a clinical trial that discounted us more than $500. Also, the initial diagnostic cost would have been much higher if we had allowed a biopsy right off the bat. We declined since the hospital confirmed that the biopsy results would not change the treatment (amputation regardless). Keep in mind everyone already knew this was not osteosarcoma but rather a soft tissue sarcoma. Then, after getting into the trial, a biopsy was done without charge. I believe that many teaching hospitals (especially) are so used to pet owners wanting to do everything possible, and when we asked them to take a step back and explain what purpose the biopsy would serve, they really had no answer. This taught me that sometimes it's really quite all right to say “no” to some things. If chemo is advised, we may decline that as well. Dakota's happiness and joy in living are very important to me, and I'm not sure he would retain either if he had to do chemo. But I guess we will wait and see. From abandoned puppy to Tripawd Warrior Dude, Dakota became one of the 2011 February Furballs due to STS. Our incredibly sweet friend lived with grace and dignity till he impulsively raced over the Bridge on 12-15-12. Type of chemo given? Cooper is not having chemo. Private practice or teaching hospital? Private – Dr. Greg Marsolais, MS, DVM, DACVS came in from northern California to perform surgery as we do not have veterinary surgeons in our area. What size is your dog? 85 lbs. Type of chemo given? Do not have biopsy results back so no decision has been made. What size is your dog? – Did not do chemo. I am very lucky to work at the clinic with wonderful vets that I have pretty much on call 24/7 and get a 50% discount. But even without the discount it looks like surgery here is much cheaper than most other places. Of course I am in the south so vet care is cheaper here in general. What size is your dog? Add Reply: Costs of Amputation and Chemotherapy for Dogs: What Did You Pay?